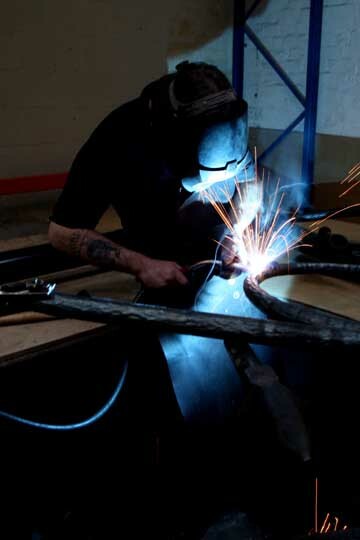 Electric welding is often referred to as arc welding, since it uses a very powerful spark to generate heat. This melts and fuses the metals to be joined. It is very versatile, since work can be welded in situ and large pieces can be joined together. TIG, a specialised type of arc welding, is very clean. It gives off few fumes and little spatter, because of this it is useful for fitting work indoors or on site. One disadvantage of arc welding is that the resultant weld bead can be considered unattractive. Careful grinding is required to smooth out the weld and blend it in with its parent metals. Should this prove impractical, the weld can be hidden when possible. At Verdigris the appearance of our welded work is always carefully considered.